I don’t talk about running a whole lot, but it’s one of the things I like to do. I’ve been running for more than 20 years now, so let’s just say I have passed my peak. I hope to keep running until I am old and senile. I have never been competitive, and I am certainly not a competitive runner, but every once in a while, if a race is small enough, I can score a little something in an age group award. I just ran the Columbia Gorge Half Marathon in Hood River, OR, and dang, it was totally GORGE-ous. The course snaked up and down the old highway that runs parallel to the Columbia River. The fall colors were in full force, and we even got to run through a tunnel at one point. Fortunately, it didn’t rain, but it was pretty cold! There was a full marathon and a half marathon. 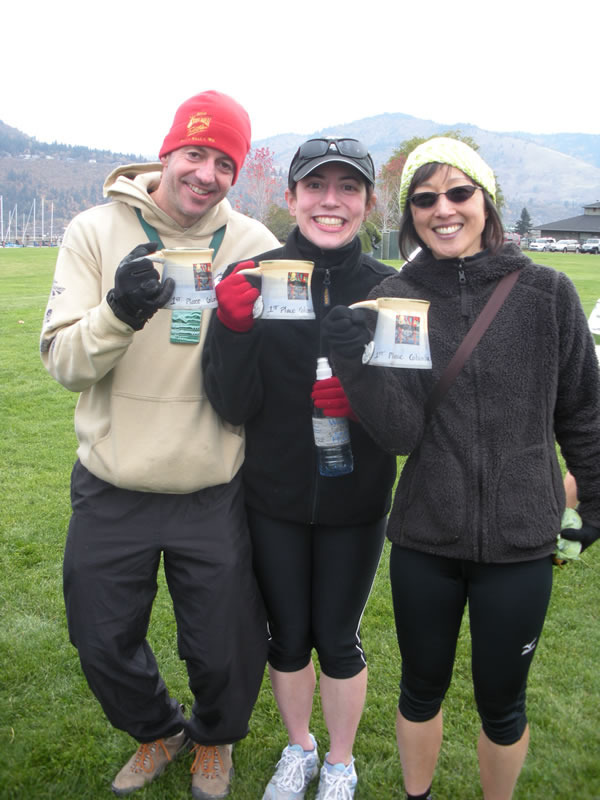 People haven’t discovered this great event yet, so the fields were relatively small, small enough that I won a giant mug for winning my age division! My friend Fran and her friend Frank also won their age divisions! The mug is huge and, as you can see, handmade. Hood River is known for the outdoors and windsurfing and hippies, so the mug, you know, reprezents, or whatever. It was a really fun and friendly event, and a good time was had by all, including Christina, who is quite a badass, and whom I hope will continue to join us on our weekend runs. Okay, I should have a finished object up soon, and Peter has already had some choice comments about it. Consider yourself forewarned. Well done! I am so impressed. Congratulations. I grew up in Hood River and I miss it. But that was before the windsurfers came to town. It was farm country when I grew up. Awesome pic…that mug totally reprezents!! Congratulations! I’m definitely not in the “win my age category” yet, and I may never be. That doesn’t stop running from being a great activity! Your race sounds awesome! wow. you are all totally rocking the PNW fashion thang. I love that look…..
Mariko – You ARE a star runner! congrats!!! Wow, that sounds like the run I want to do….when I start running more than 3 miles again! I have this darn hammertoe….. maybe I should send you a photo. It’s SO hideous. i love all those frocks and smocks (and teh sequin skirt) you’re making. You’re so multi-talented!